Katelyn Harrington (11) from Cork city wants everyone to know her best friend Grace O’Brien (12) is “just like everyone else, but funnier”. Grace, who has Down syndrome, is the subject of a 10-page book Katelyn has written, titled My Friend Grace. It is up for an Aldi Foróige youth citizenship award on Saturday and has been distributed to Down Syndrome Irelandcentres across the land. The book tells how Grace is “always kind” and sometimes when she and Katelyn are together they “laugh so much that we both fall over”. Katelyn explains she chose to write about her friend, because although she “has an extra chromosome” and “finds the learning hard sometimes…she is my best friend in the whole world”. The pair met in senior infants, she says and “she is very special to me”. This is the 50th year of the youth citizenship awards, first run by Foróige in 1969, in which young people across Ireland are celebrated for projects that are a “force for good” in their communities. Among the issues tackled by the young people are homelessness, bullying, global warming, mental health, animal welfare and the environment. 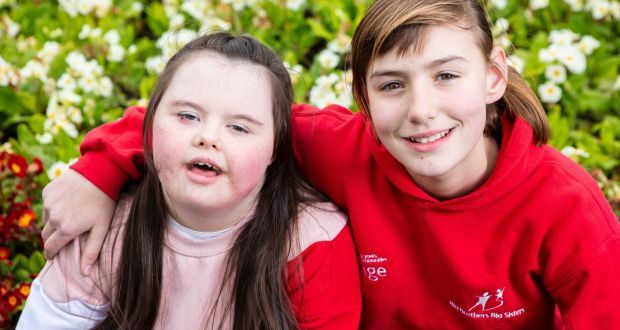 Katelyn wanted to do something for her Foróige citizenship entry that would both increase awareness of Down syndrome and how people with the condition “are just like everyone else” and to honour her friend. She wrote it with her older sister, Vera, and got photographs of Grace to use in the book from Grace’s mother.